Ever since my buffalo strapped on his blue backpack, I’ve been more aware of the back-to-school books that show up each summer/fall. 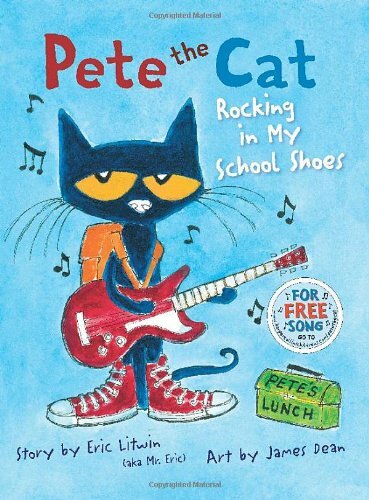 When I saw that Pete the Cat had some snazzy new school shoes, I invited author Eric Litwin, aka Mr. Eric, today’s guest, to join me for an interview. Did you come to the children’s book world from the world of music? Can you explain how that happened? I was a musician and storyteller who played interactive music and stories at school assemblies, libraries and festivals. I had a vision to create a book that blended amazing art, cool music and storytelling together. I contacted my favorite artist, James Dean, the creator of Pete the Cat, and let him know I wrote a story for his character. He loved the story and we decided to self-publish a book called PETE THE CAT: I LOVE MY WHITE SHOES. The book did very well and we ended up signing with HarperCollins. This past Sunday (September 4, 2011) our books were #1 and # 2 on the New York Times Bestseller List for picture books. A big fat congratulations to you both! How much did you and illustrator James Dean collaborate on the two Pete the Cat books? We shared ideas and worked together. We are a very strong team. Did you read a lot as a kid? If so, what were some of your favorites? I did read a lot. And, I read a lot now. I loved The Boxcar Children, Winnie the Pooh and poetry. Why do you think Pete cares so much about shoes? I am really not sure. He just likes them the way we all love a new pair of shoes. Does Pete the Cat have any future plans? The next book, PETE THE CAT AND HIS FOUR GROOVY BUTTONS, come out in one year. You can learn more about Eric by visiting his website. Pete the Cat, of course, has his own website as well. And happy Back To School, everyone! This entry was posted in Uncategorized and tagged back to school books, Eric Litwin, HarperCollins, I Love My White Shoes, James Dean, Mr. Eric, New York Times Bestseller List, Pete the Cat, Pete the Cat and His Four Groovy Buttons, picture books, Rocking in My School Shoes. Bookmark the permalink. What a great song! I love the story!